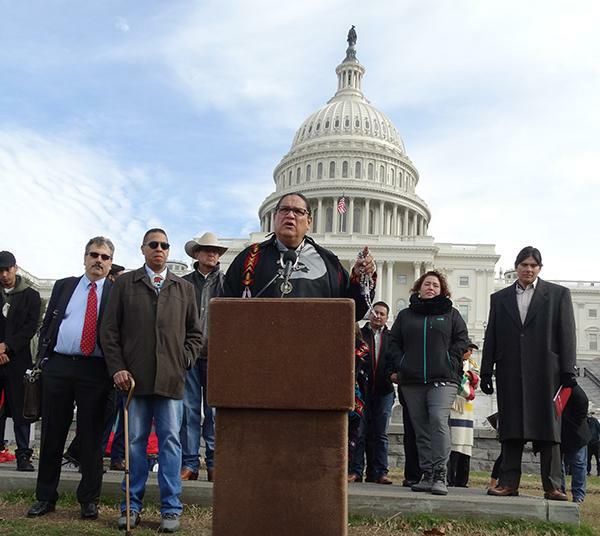 Washington, D.C. – November 14, 2018 – The National Indian Gaming Association (NIGA) joined other Native Nation organization, tribal leadership and others in supporting the “Stand with Mashpee Walk and Rally today in support of H.R. 5244 and S. 2628 bill – the Mashpee Reservation Reaffirmation Act. On September 7, 2018, the Department of the Interior (DOI) issued its first Carcieri decision in which it refused to reaffirm its authority to confirm the status of the Mashpee Wampanoag Tribe’s reservation. The decision opens the door for the Mashpee Wampanoag Tribe’s reservation to be taken out of trust and disestablished and follows on the heels of the federal governments' refusal to continue to defend the status of the tribe’s reservation in court. House bill, H.R. 5244, the Mashpee Reservation Reaffirmation Act was introduced in the House on March 9 by Rep. William Keating (D-MA 9th District) which brought about a bipartisan coalition of some 20 co-sponsors. The companion bill in the Senate, S. 2628, has been introduced by Sens. Ed Markey and Elizabeth Warren. If passed, the legislation would dismiss a lawsuit filed against the tribe as well as reaffirm the US Department of the Interior’s 2015 decision to take 320 acres of Mashpee land into trust for the tribe. He added, "The Wampanoag, the People of the First Light, greeted the Pilgrims with peace, friendship and hospitality, and gave them a home at the Place of Hills, "Massachusetts" in the Wampanoag language. The Wampanoag helped the Pilgrims, taught them to plant corn, where to hunt and fish, and helped them survive. It's only right that the People of Massachusetts should stand up for the Wampanoag." “Thankfully, Congress won't stand for still for this injustice, and the Massachusetts delegation seeks to restore the Wampanoag homeland to Indian land status by the enactment of the Wampanoag Reservation Act. The National Indian Gaming Association fully supports the Wampanoag Tribe, the Massachusetts delegation, and Congress as they work to restore justice by recognizing the Indian land status of the Wampanoag Reservation.” Stevens concluded. The bill sponsor Rep. Keating, as well as Rep. Joe Kennedy III (D-MA 4th District), addressed the gathering, assuring support of the bill passage. Tribal Leadership standing with Mashpee included Mashpee Vice Chairperson Jessie “Little Doe” Baird, Sault St. Marie Chippewa Indians President and NCAI First Vice President Aaron Payment, Narragansett Indian Chief Dean Stanton, Quinault Indian Tribe President Fawn Sharp, Scott Weston, Oglala Sioux Tribal President, Shinnecock Indian Nation Senior Trustee and NCAI Northeast regional Vice President Lance Gumbs and Mashantucket Pequot Tribal Nation Chairman Rodney Butler. The gathering brought together more than 200 supports, which included tribal members of the Mashpee, who traveled by bus to be part.